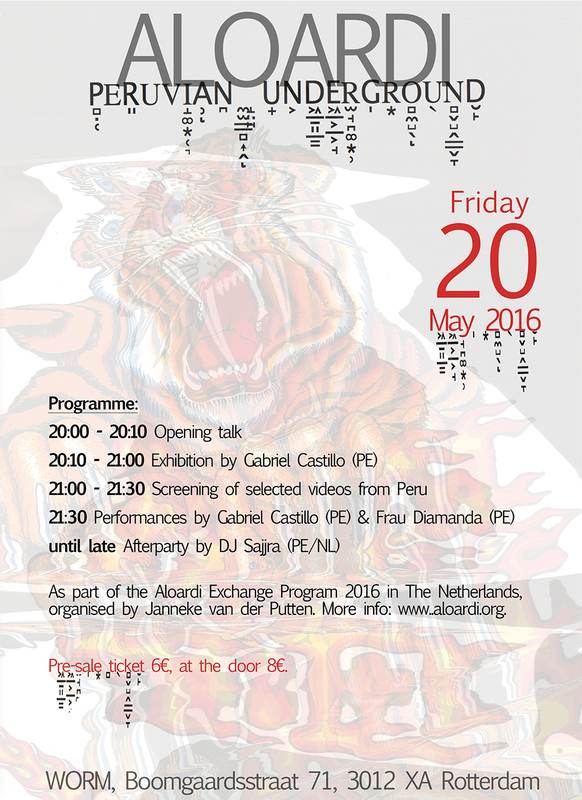 As highlight of the Aloardi Exchange Program 2016, Aloardi presents at WORM an exiting programme of underground Peruvian multimedia art, videos, performance, music, and party. 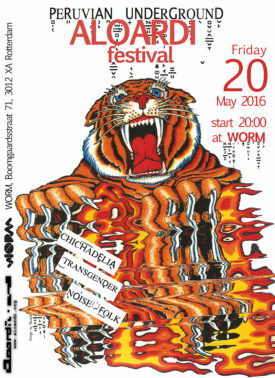 This event concludes the artist-in-residency of Gabriel Castillo at WORM. FRAU DIAMANDA is Hector Acuña: a transgender visual artist, drag performer, curator, cultural agent, translator, writer, Dj, visagist and actor/actress from Lima, Peru. Frau Diamanda has initiated many projects linked to transgenderness as political stance, and is determined to confront patriarchal obstacles predominant in the art systems, the mass media, the networks and life itself. GABRIEL CASTILLO hacks toy guns and turns them into sound instruments, making glitches and modulations in sound and light. He loves the nature of the digital error; whether audible or visual, and induces basic code editors, de-contextualising electronics, overcoming their logical functionality, and revealing their natural spirit. He is looking for contextual demonstrations, or synesthetic epiphanies. Gabriel Castillo is artist-in-residence at WORM in May 2016. DJ SAJJRA will play a crossbreed of post-apocalyptic pop, roughed up Andean folk, Peruvian chicha, new/no wave, and all kinds of underground stuff from sixties til now – all from South America! Sounds crazy? Maybe so, but this stuff will get you going one way or another! DJ Sajjra is a project of Chrs Galarreta. Today he lives between Peru, France and The Netherlands. There will be plenty of interesting records, zines, books, tapes and T-shirts too! Next to the Aloardi releases you will find a special selection there, brought to you by the great Underbelly shop.